How to Police a Porous Fortress? Monica den Boer. The purpose of this article is to provide an overview of the way in which the European Union has gradually but steadily built a security architecture based on the control of mobility and borders. Different logics of policing are interwoven in several projects, which are strongly interdependent with technological innovation. Furthermore, the European policing of mobility is primarily performed by mounting surveillance - both inside and beyond European borders - by means of which all forms of movement (transactions, travelling, etc.) are subjected to intensive monitoring by multiple actors who are interlinked through strategies and systems. The main finding is that border policing is shifting in a fundamental way from fixed to fluid, from territorial to virtual, and from physical to technological. Hence, paradoxically, though mobility is strongly promoted as one of the main virtues of the European Union, Europe`s precautionary protection may be at ill-ease with the free movement of people. The article seeks to stimulate the knowledge and debate about deeper shifts in Europe`s security apparatus and develops this from a law enforcement perspective. (1) Academic Dean at the Police Academy of The Netherlands, Member of the Committee on European Integration of the Advisory Council on International Affairs and Visiting Professor at the College of Europe in Bruges. In the German speaking academic world Police Science (Polizeiwissenschaft) is a fairly new and little known area of social science. Accordingly, the academic status of police science is anything but firmly established but rather at a `hybrid` stage of development. The very combination of policing and academic study/research seems to remain largely incompatible not only to police managers but also to main stream sociology. German police science differs substantially from the Anglo-American-Australian approach. One main difference pertains to legal traditions, others are due to historical and cultural developments that will be taken up in this descriptive essay. However, Anglo-American-Australian police theories have a lot to offer to German and European police scientists and this will be demonstrated. 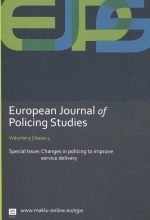 For a future common approach to an evolving European police science similar descriptions will be required from other European countries to establish a comparative foundation of joint EU police studies. Some of the principal dimensions of such a comparison will be sketched in this essay. It concludes with a presentation of empirically based police studies carried out by instructors and Master students at the newly founded German Police University in Münster. Topics are media coverage of clashes between police and demonstrators, a typology of third party intervention in cases of assault in public places and COREPOL (EU FP7), a comparative security research project aiming at an improvement of police-minority relations through means of restorative justice programs. (1) Professor and Head of Department of the Department of Police Science at the German Police University (Germany), DAAD Professor at Northwestern University, and guest professor in Maastricht/NL, in Sydney/Australia, and in Tokyo/Japan. (2) Senior Researcher for `COREPOL` (EU FP7).